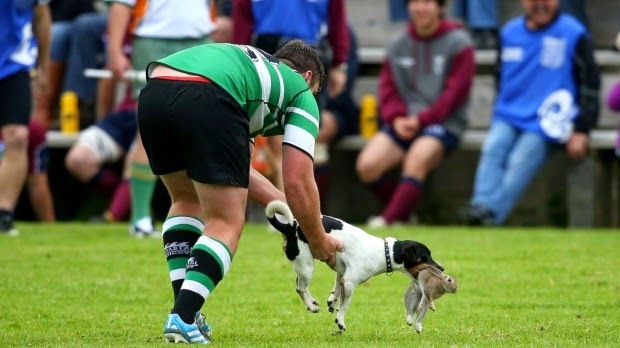 Dog catches a rabbit in the middle of a rugby match! There was a pitch invader at the Okato Domain when Coastal and Inglewood rugby teams played each other. "Having already been threatened with a pair of size 10 boots earlier in the game, the unnamed canine looked to have disappeared through the hedge and out of trouble as the match progressed. He wasn't gone for long. A few lineouts and a couple of scrums later the hound was back with a score of its own - a rabbit." The dog eventually dropped the animal and it was quickly euthanized by a spectator with a quick snap of its neck. "The battle might have been lost but the dog won the war, emerging five minutes later with the rabbit in its mouth before racing under a parked ute for a good feed." Not a bad effort from the Jack Russel - those things go like lightning when they spot rabbits or hares so no surprise really that this dog was undaunted by the rugby match for his chase!